On Monday I put forth the notion that most of our cities are missing a merchant class, a group of business owners that were vital to the health of our places (and I believe still are). I didn't realize that there would be confusion with the distinction I drew between merchants and entrepreneurs. It is an important enough point that I want to take today to add some clarification. Entrepreneurial people...exist in places like the neighborhoods devastated by Hurricane Sandy. Or the Gaza Strip. I admire the hard work and ingenuity, but they do not constitute a merchant class. Entrepreneurs -- and I am one of them -- are, at their core, opportunists. I point out that I am one because I am not using the word "opportunist" here in a derogatory way. There are opportunists like the guy who will sell you a bucket of water when you house is on fire and there are opportunists like the person who will acquire cast off clothes in bulk to give to the poor hoping the next church collection will cover the costs. I don't ascribe positive or negative morality to the term entrepreneur. It is more a state of mind. My point in bringing up a place like the Gaza Strip was to indicate that entrepreneurs are everywhere. They cannot be wiped out and will exist in every society. They can be stifled, but not eliminated. This was why the Soviet Union could not keep out Levi jeans and prisons can not eliminate drug use. Like water finds every available crack, entrepreneurs will ultimately exploit every opportunity. A successful society directs entrepreneurial activity for good, rewarding those few that succeed and not punishing too severely the countless number that fail. Our (until recently) very lax bankruptcy laws were designed to do just that. The other reason I used Gaza as an example is that entrepreneurs thrive on volatility. The more tumult there is, the more incentive there is for risk takers. Fortunes are not made in calm markets but in times of great change. So if entrepreneurs exploit new opportunity and thrive in times of volatility, merchants exploit their position in the current arrangement and thrive in times of stability. We can go back to the merchants of antiquity to see the difference in stark detail. The explorer in the ship who traveled to distant lands in search of valuable goods was an entrepreneur. The guy that had a shop on the docks to receive the entrepreneur's haul was a merchant. He paid the entrepreneur then turned around and sold the goods through his distribution channel, pocketing a margin for the transaction. Maybe one out of five entrepreneurs would return to port successful, but those that did would be handsomely compensated. In contrast, the merchant always made money. When I think American merchant of the 1960's, my thought goes to the shoe salesman. In 1960, every American town had a shoe store in the downtown. There was a limited selection of shoes and boots with a capacity to acquire specialty items through a wider distribution network. The shoe salesman knew shoes, would fit them to the customer's needs and would likely also fix them when they wore down. This was a stable business. Everyone in town needed shoes and the shoes would need replacement at a regular interval. There wasn't a lot of selection in shoes -- and not competing brands like Nike, Reebok and Adidas -- so there was no need for more than one shoe store per neighborhood. It was a stable business, likely handed down from generation to generation. Nothing more, nothing less. Where is this shoe salesman today? He is not owning his own shoes store for starters. In most towns today thre are no shoes for sale. You need to drive to a regional center where there is a Walmart, shopping mall or strip center to find shoes. As a consumer, there is a much wider selection (although never enough, so claims my wife), but there are fewer people throughout the region selling them. If the shoe salesman has a job in the trade, at best it is a franchise owner, but since he is not a risk taker, he most likely is one of the store managers. He is part of the corporate structure and, while he likely works hard and receives fair wages and benefits, his wealth and future prosperity is not tied to the business. Now we're getting to what I see as the difference this has had on our cities. It is not the obvious -- the dislocation of jobs, the consolidation of opportunity, the leaking of wealth out of the community -- but something more subtle. Entrepreneurs are risk takers. They thrive in times of volatility. Merchants are not risk takers. They prosper in times of stability. Take the merchants out of America's cities and what do you have left? You have the vast majority of people who do not have business-oriented minds and then you have entrepreneurs. Risk takers. Imagine yourself in the modern city council meeting. The staff -- which has their own perverse incentives -- brings forth the economic development plan, a vision assembled by intense community engagement. It calls for millions of dollars of investment in new infrastructure for an industrial park on the edge of town, millions more for Main Street "beautification" and tax subsidies and incentives to get business growth going. Everyone nods. This is what successful cities do; they "invest" to make things happen. Actually, to be more precise, this is what entrepreneurial cities do, they invest speculate/gamble in the hopes of making things happen. For the entrepreneurial mind (the only kind left in the city with ideas and initiative), these are logical moves. Have you ever met an entrepreneur who was not confident they were making logical moves? This is where the merchants are badly needed. Take that same council meeting back to 1960. The staff comes forward with the grand plan for expansion. The merchants are in attendance at the meeting -- heck, it probably takes place in one of their shops, especially since the council is largely made up of merchants -- and they look at each other and shake their heads. One stands up and says, "Just whose money are you planning to gamble with here?" There is a general consensus reached fairly quickly: we welcome entrepreneurs and risk takers, but not where their backstop is the collective dime. Our businesses are doing just fine. While more growth would be nice, it is not worth the risk. You don't get this kind of reaction from the manager of the franchise shoe store. That person likely has better things to do than show up at city meetings -- things that compensate for their low job satisfaction -- and will cede the decision-making to those that show up. The entrepreneurs. They are trying to make things happen, after all. I'm not trying to glorify the lost merchants. I would likely strongly dislike most of these people on an individual basis, especially in my own town. They would tend to be penny pinching, zealous protectors of their own self interest. I'm an innovator -- I want to shake things up -- and so this type of person drives me crazy. But if we step back and look at them, the merchant class is the needed check and balance to the frequently irrational delusions of the entrepreneur. The reasons our cities are financially failing are complex, numerous and varied. I'm not sure if we can put the absence of a merchant class as a cause or an effect. Either way, their absence is missed. 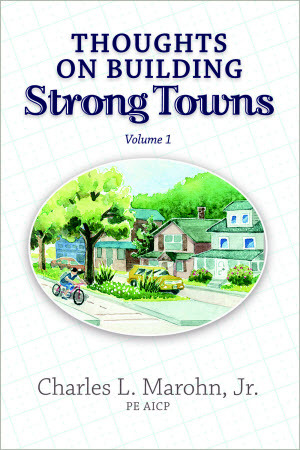 Nurturing them back into existence should be a strategy for those seeking to build a Strong Town. Their emergence will be a sign of success.